I created this site in memory of my father, Bertrand R. Brinley, who wrote the Mad Scientists' Club tales. Illustrations used by permission of Bertrand R. Brinley, L.L.C. THE BIG KERPLOP!! NOW HAS PICTURES!! 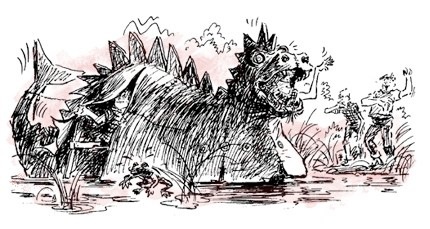 A newly illustrated edition of The Big Kerplop! is now available from Purple House Press. The late Charles Geer, the only illustrator of the Mad Scientists’ Club stories, created several pictures for the book. When you see them I think you will agree that even though almost four decades have passed since the original publication of the book, he lost nothing in capturing the gang and its exploits. The Mad Scientists’ Club—the first of the four Mad Scientists’ Club books—is now available from Amazon in the Kindle format. To get your copy, go to: http://www.amazon.com/dp/B0030T1WIM. THE MAD SCIENTISTS ARE ELECTRONIC!! !